Skip the mall and consider these do-it-yourself gifts from the garden instead. No, not bouquets of flowers, but infused vinegars, oils, salts and beauty potions handcrafted from easy-to-find garden herbs. Whether you grow mint and oregano on your kitchen windowsill or in your backyard, pick up basil and cilantro at the farmers market or pass fragrant rosemary bushes when you walk the dog, the herbs you need for these inexpensive and eco-friendly gifts are easily within reach. 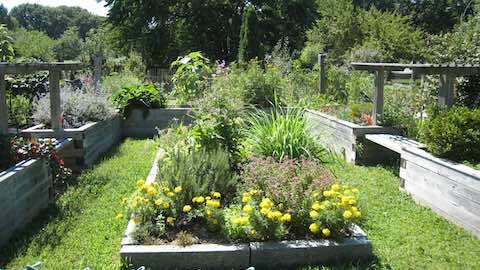 Here’s step-by-step advice from master gardener Lora Hall. She cultivates an urban garden in downtown Los Angeles for the farm-to-table menu at Cube Cafe in West Hollywood, Calif., and she also runs Full Circle Gardening, which provides services to the home gardeners of Los Angeles. Start with a clean quart-size jar, which can be a recycled bottle from pasta sauce or other pantry staples. Rinse two handfuls of a food-friendly herb like tarragon, thyme, rosemary or oregano. Stuff the herbs, stems and all into the bottom of the jar. “You want roughly an amount that would fill a cup,” says Hall. Fill the rest of the jar with an inexpensive white wine or apple-cider vinegar, making sure all the leaves are submerged. Cover the bottle with a lid and let it sit on your countertop or windowsill for at least two weeks to let the full flavors of the herbs infuse the vinegar. When you’re ready to bottle the vinegar, slowly strain out the now discolored herbs through a funnel lined with cheesecloth or a piece of an old but clean T-shirt, into a smaller jar, like one used for bottled salad dressing. If the jar isn’t full, top it off with uninfused vinegar. Tie a piece of twine or ribbon around the bottle and through a make-it-yourself label. “The vinegar is a great way to bring out flavors in salads, stews, soup or chili without adding extra salt,” says Hall. With a shelf life of six months or more, this is a gift your friends will enjoy long after other trinkets have been forgotten. Rinse and dry a handful of your choice herb. You want about 1/2 cup in all. Place the herbs in the bottom of a small jar and cover them with a cup of extra virgin olive oil. Let the mixture stand in a dry cool place for a week or two. Strain out the herbs and pour the oil into a clean jar. Follow the directions for herb-infused oil, choosing a fragrant herb like lavender or chamomile (you can use dried chamomile that’s sold as a loose tea). Place an ounce of solid beeswax (look for this at a farmers market stand that sells honey or in a natural-products store) in the top of a double boiler. Slowly melt the beeswax over a low flame, whisking in the olive oil in a very slow stream. Transfer it to a blender; add a cup of water about an ounce at a time, pulsing to blend. “Go very slowly,” says Hall. “It will take about five minutes to get the nice creamy emulsion you want.” Pour it into a jelly jar. The consistency will be slightly liquid. By the next day or two, it will harden to a creamy texture that makes a wonderfully rich moisturizer. Woman to Woman: "Gift Ideas From the Garden"